Copic Colouring Negative Diecuts to Create Background plus a Video! Hey everyone! Welcome back to my blog. I have a video tutorial to share with you today. 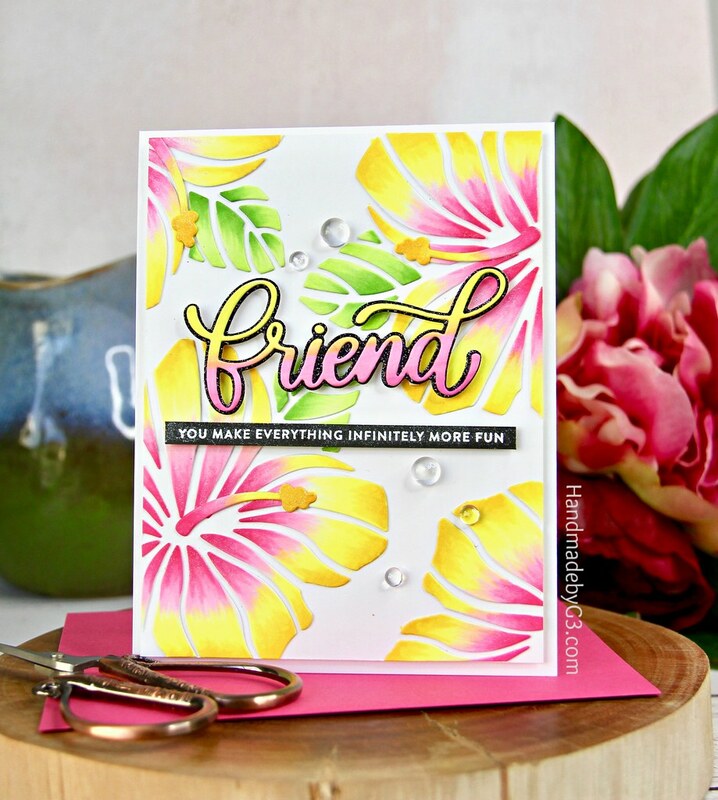 This card below I shared couple of weeks ago using Simon Says Stamp Good Vibes collection dies had very good response and a tutorial was requested. I made a similar card using the exact same techniques and made a video of it. Here is the photo of the new card. I used an older frame die from Simon called Cosmo Flower Frame die and Big Thanks die to make this one. Here is the video tutorial of the card. You can use any of the floral outline die for this technique. The bigger the better for the dramatic effect. Colour combination plays an important role for the dramatic effect. You could also try using watercolours instead of copic markers. Colour pencils will be tedious and time consuming colouring each and every negative piece. The backer dies are awesome because using contrasting colour for the backer will makes the coordinating sentiment pop from the background. I love using Nuvo Crystal drops. Adds subtle texture and dimension to the flowers. Many thanks for visiting my blog today. Have a lovely day! This may be the prettiest card I’ve ever seen! I love it. Both of these cards are gorgeous!! I just finished watching your tutorial and LOVE the cards you made. The colors are beautiful!!!! Thanks so much for sharing!! So beautiful and I love the colors! This is such a fabulous idea, genius in fact!! And both of your cards are simply gorgeous!! !